2018 became the year, where Danish insurtech finally took the leap. We celebrated the great news by introducing the insurtech-prize to reward the “Greatest Danish insurtech-news 2018”. Seven candidates were nominated in my blog post on borsen.dk in December and the winners were announced last week after a voting process, where the entire Danish insurance and insurtech-community had the opportunity to vote for their favorite. The biggest Danish insurer, Tryg Forsikring, has communicated the will to cannibalize their existing business. In January 2018 they threw 25 million DKK into the partnership with four young tech entrepreneurs committed to make young people buy insurance. They have created Undo and aspire to make insurance as easy (and exciting) as Netflix. The size of the investment shows that Tryg is serious about the cooperation and it is interesting to see, if Trygs support as well as the hard work of the young crew will lead to a lasting Danish insurtech-success. GoBundl was celebrated the most promising fintech-team at the Copenhagen Fintech’s Venture Cup in 2017. However, the team had a hard time raising enough capital to realize the dream of a Danish peer-to-peer insurance company. Instead they decided to exchange the dream for an honourable exit. In February 2018 they were acquired by TIA Technology, a Danish supplier of insurance core systems. TIA plans to integrate GoBundl’s platform in their offering. And GoBundl’s team is now part of TIA. Blockchain was also added to the Danish insurtech-agenda in 2018, when the Danish giant and the world’s largest shipping company, A P Moller – Maersk, joined in as an insurtech-entrepreneur. Maersk went live with Insurwave in May. Insurwave is the world’s first blockchain platform to support marine insurance, and the ambition is to push a standard platform for insurance transactions that can reduce transaction time and costs. The initiative is difficult to overlook, especially because Maersk has the financial strength to back it up. 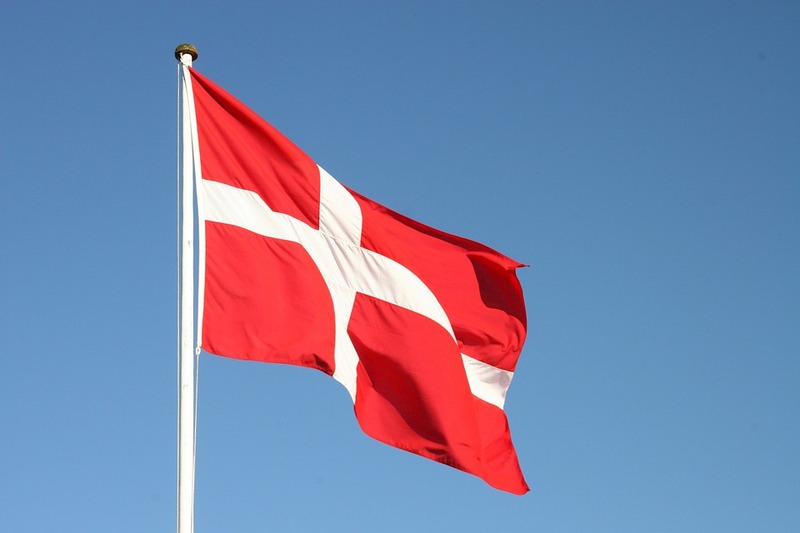 The UN sustainable development goals got extra Danish support in June 2018, as Skandia Pension saw an opportunity in the Danish insurtech-startup, Matter Pension. Matter has developed a digital platform to allow pension customers to ensure that their savings are invested with high regards for human rights and responsible business practices. The cooperation between Skandia and Matter Pension is a good example of how established companies can develop their customer experience by including the new ideas of an insurtech-entrepreneur. We are not accustomed to hearing about successful funding rounds for Danish insurtech-entrepreneurs, but nonetheless this happened in September 2018. Here, Grandhood received over 20 million DKK from Seed Capital, Sunstone Capital and Speed ​​Invest. Grandhoods ambition is to challenge the pension industry by offering cheap and 100% digital pension solutions to entrepreneurs and small businesses. Grandhoods business idea is inspiring, because it follows the recipe for disruption. They focus on the non-consumers, who are overlooked by the established companies. Insurtech is not only about entrepreneurs. We have become accustomed to a high level of digitization in the Danish insurance industry and that is a situation that will continue to develop. The Danish insurance companies invest heavily in digitization and new technology. In 2018 several of the biggest insurers made decisions to engage in big projects with the purpose of replacing old, proprietary core systems with new standard solutions to secure a digital infrastructure fit for the future. The industry’s general attention to insurtech is clearly increasing. This is reflected, among other things, in the growing interest to participate actively in the ecosystem around Copenhagen Fintech. The number of insurance companies partnering up with Copenhagen Fintech is increasing. And for the first time ever, insurtech was on the agenda at the Copenhagen Fintech Week in June 2018. Before the disclosure of the winners, I would like to thank everyone from the Danish insurance and insurtech-community, who have contributed to the survey. I think that I am not the only one, who can see, that there is reason to celebrate the Danish insurtech-initiatives in 2018. It has been a year of acquisitions, big investments, a successful seed round and several promising collaborations. A development that I trust will benefit both customers and the insurance industry through greater variety in customer solutions and an even stronger digitization. All candidates received support, but in the end, it was TIA Technology and GoBundl, who got the greatest support. Thus, a total of 37 percent believe that GoBundl’s exit is the biggest insurtech-news in 2018. GoBundl’s three entrepreneurs had to say goodbye to the dream of creating their own peer-to-peer insurance company. 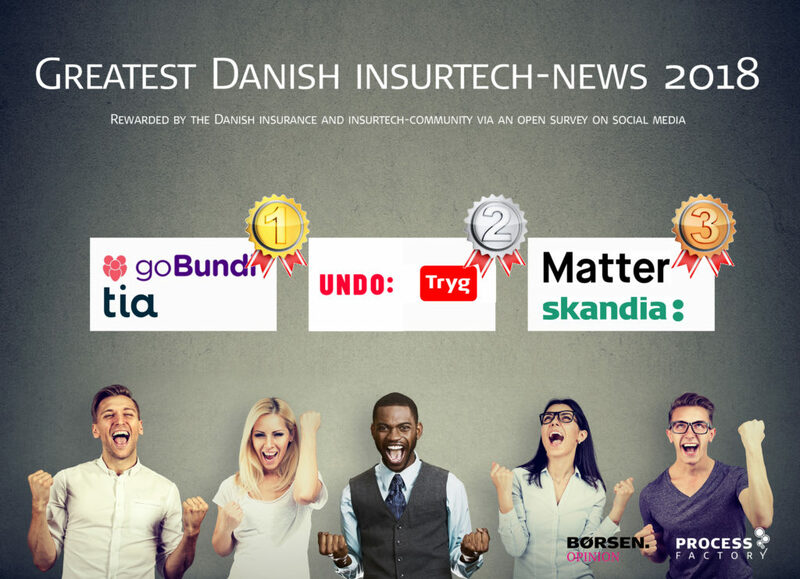 On the other hand, they made an honorable exit and their technology and competencies are now contributing to expanding TIA Technology’s total offering, an achievement that is rewarded by the Danish insurance and insurtech-community with a top ranking. It was a close fight, but Tryg and Undo ended up with support from 34 percent of the voters. The fact that the ambitious entrepreneurs in Undo succeeded – through thorough preparation, a strong team, network and good timing – to get Tryg to buy into their vision with an investment of 25 million DKK, is a breakthrough for Danish insurtech, and it is of course rewarded with a second place. Finally, Skandia and Matter won the third place with 15 percent of the votes. The sympathetic vision combined with the fact that the partnership is the first of its kind between a Danish pension company and an insurtech-entrepreneur ensures them the acknowledgement.